Confirmed. 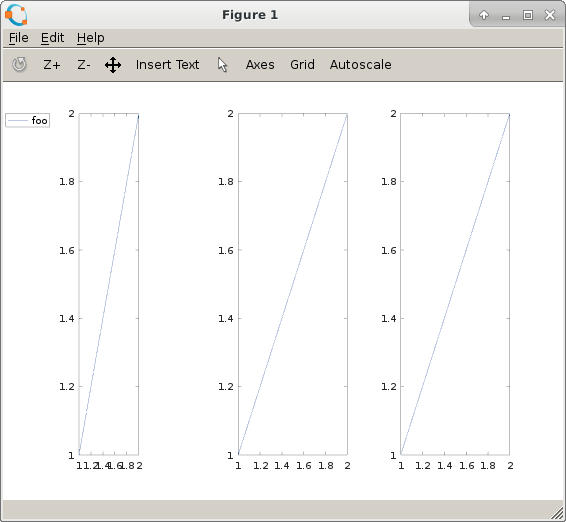 The example can be simplified by using just a single plot. See the example transcript below. As you can see, legend is not only shifting the axes position to the right to make room for the label "foo", but it is shrinking the width of the axes by more than is required. I can restore the full size by expanding the width field of the axes "position" property back to what it should be. I'll check to see if this is an easy fix, but it might have to wait until the first bug fix release for the 5.0 branch. Yeah, I can confirm this with the qt toolkit in Octave 4.4 and 5. It does not occur with gnuplot. Reporting per jwe's suggestion. This is with octave 4.2.2. Can anyone verify if this still exists in a later octave?